This design is heavily inspired by one of my favourite YouTube artists--her channel is now called ArcadiaNailArt, but her old channel is IndigoNova1, and this video is beautiful. I used the same idea, but in seasonal colours, plus some handpainted bows! I used a lot of polishes for this one! The base is the pink OPI Sheer Tint polish, called Be Magentale With Me. Just one coat gave my nails a healthy, pretty pink look--which is great, because the dark red I used in my last mani stained them pretty badly! For the tips--first, I used three creme polishes: Orly Pointe Blanche (white), Revlon #280 Bubbly (pink), and Revlon #680 Revlon Red (... red). Over top of that, coordinating glitter polishes, all China Glaze: Snowglobe (white), Material Girl (pink), and Love Marilyn (red). 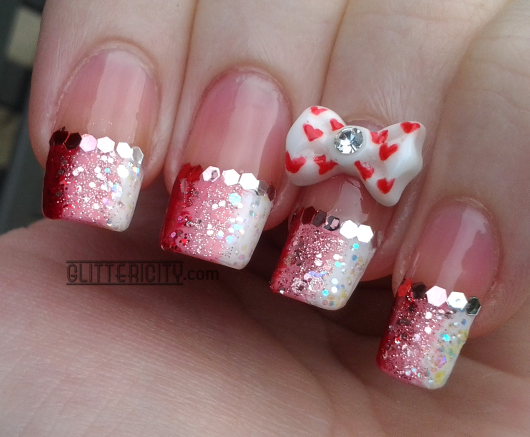 Instead of the rhinestones that she used, I went with large Born Pretty Store hex glitters to outline the tips. I still used coordinating colours to the tip below. I wanted to go with stones, actually, but realised I didn't have any in the right shade of pink! I should remedy that ASAP. 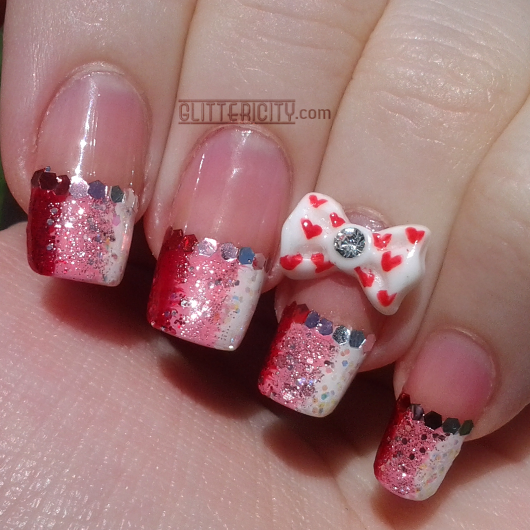 For the finishing touch, to make this entirely over the top (teehee), I used my white plastic bow embellishments (also from Born Pretty Store) and carefully painted tiny red hearts on them with acrylic paint. Finicky work, and they aren't perfect, but I think it came out nicely enough! I secured one to each ring finger, near the cuticle, and then sealed the whole lot in with two coats of Seche Vite topcoat. Aren't they just adorable? I'm really pleased with them ^_^ and even though the bows will inevitably pop off, probably when I wash my hair later, the rest of it should stay on for a few days and I can enjoy some pretty glittery tips. 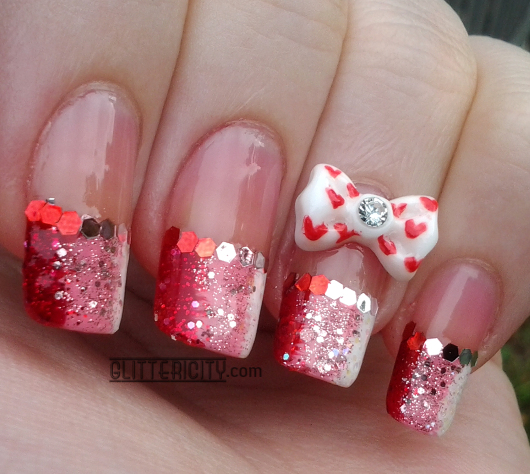 I love how the tips are shaded and those bows are adorable! !